In first and second grade, Miss M knew well in advance of “Expert Day” at co-op what she wanted her project to be about. In the case of her second-grade project on horses, she knew almost a year in advance that this would be her topic of choice. This year, Miss M had a little bit harder time deciding. 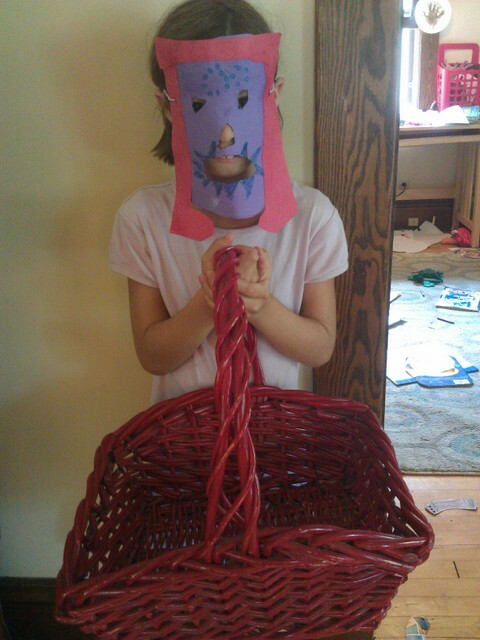 After listening to numerous suggestions from me, she decided she wanted to do her project on the history of dolls. She says she picked this topic because she is always interested in learning about the kinds of toys in general, and the kinds of dolls in particular, that children played with in different times in history that we have studied. Like the topic of horses, the history of dolls is a pretty broad topic. Unlike the study of horses (or even the study of the history of horses, which was the focus of Miss M’s expert day presentation), there weren’t a lot of books available at the library to help us learn about the topic. Dolls: An Inside Look from Raggedy Ann to Barbie by Vivian Werner — an older, somewhat longer book covering the history of all kinds of dolls in some depth. This book was written in 1991, so it doesn’t discuss newer doll “trends” very much, such as the American Girl dolls. After Miss M read and took a few notes on these two books, we began discussing how she might like to narrow her project down in a way that she could convey the information in a three minute presentation. Last year we broadened Miss M’s expert day topic by completing a lapbook and reading many library books — but with the difficulty of finding books or pre-prepared products dealing with this topic, it didn’t make a lot of sense to devote a lot of extra time beyond what Miss M would be able to convey in her presentation and display board. I offered a number of suggestions of how she could focus her three minutes of presentation time — a very broad overview of doll history highlights, a focus on a particular genre of doll (aka rag dolls, baby dolls, etc), unusual dolls, homemade dolls, or highlighting a few popular dolls over the years. After giving it some thought, Miss M decided she wanted to pick a few “famous dolls” from more recent history and talk about this history of each individual type of doll. She chose American Girl dolls, Cabbage Patch Kids, Barbie and Raggedy Ann. From this point on out, we decided the internet would be her best source of information. I helped Miss M look at Wikipedia and a few official or reputable-looking collector sites for each doll to learn a few interesting and important facts about their history. We also put together a timeline of dates for each doll — since with under a minute to talk about each doll, there were many historical highlights that Miss M would not have time to include in her talk. 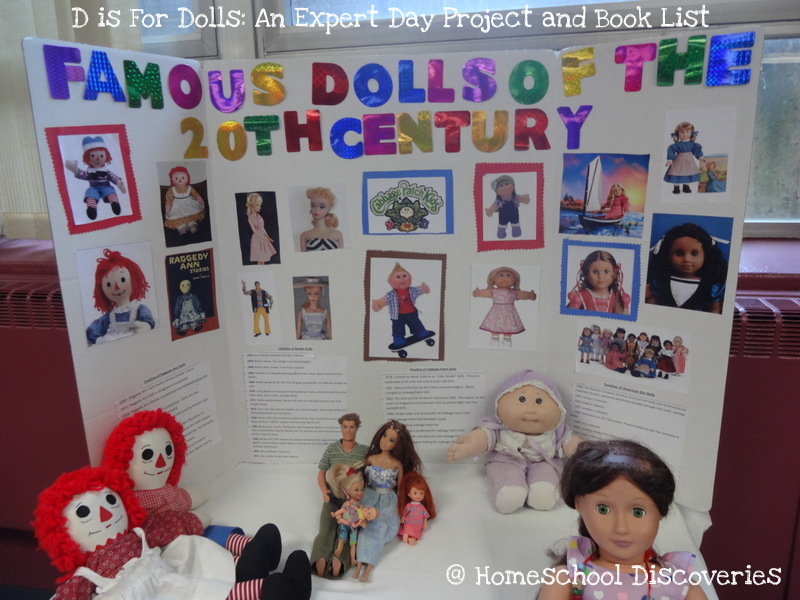 We did not add in any literature to correlate with this project — but mostly because we have already read a number of wonderful books with characters who are dolls! Books with “dolls that come to life” in some way are one of Miss M’s favorite types of books. And of course she loves Raggedy Ann and Raggedy Andy Stories and has listened to the audio books of both many times. We got started this week with our first unit in our US History studies — Native Americans and Explorers. Our “book basket” (it’s really one of those stacking cubes) is overflowing with titles. Once I got started requesting books, I really went a little bit overboard! I feel like most of the books we’ve brought home from the library about Native Americans are fairly culturally sensitive. This one, maybe not so much (especially if the two “one star” reviews on amazon are to be believed). I want to generally make sure I’m presenting honoring, accurate views of Native Americans to my kids. But this book is cute, regardless. I’m hoping that the kids understand the difference between a fictional book like this and the books from the non-fiction section of the library. In any case, this easy-reader book appealed to all the kids. Little Runner is a young boy who wants to participate in his (not-identified-in-the-story) tribe’s New Year traditions, but his mother tells him he is not old enough. 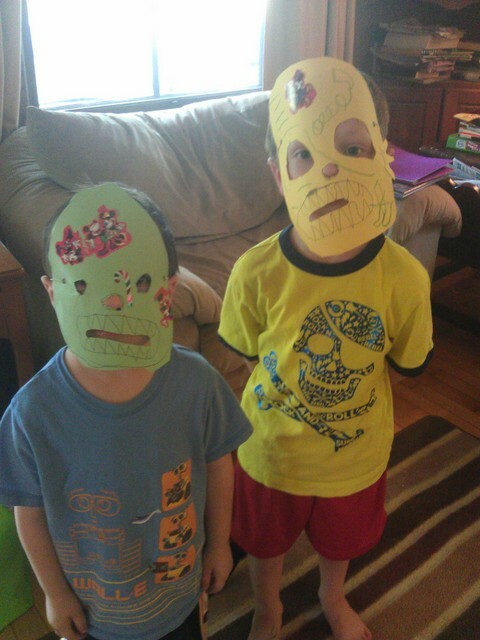 The “big boys” dress up and “steal” things from other members of the tribe. Little Runner wants to “steal” something he can use to trade for all the maple sugar he can eat. I’m sure all the kids can relate! He cleverly thinks he can “steal” Little Brother and hold him for ransom, suggesting to his mother all kinds of things she might give Little Runner to buy back his younger brother. Miss M chose this book to read from the book basket, and of course it only took her a few minutes to finish it. Mr K asked me to read the book to him (Mr. E was at Grandma’s house during this first reading). Then today Mr E tried reading some of it aloud to me. He made it through about four pages before handing the book over to me to finish it — it was just a bit over his patience and reading level at this point. If you’ve read some of my posts over the past few weeks, you may have noticed quite a few comments here and there about books and activities related to horses. 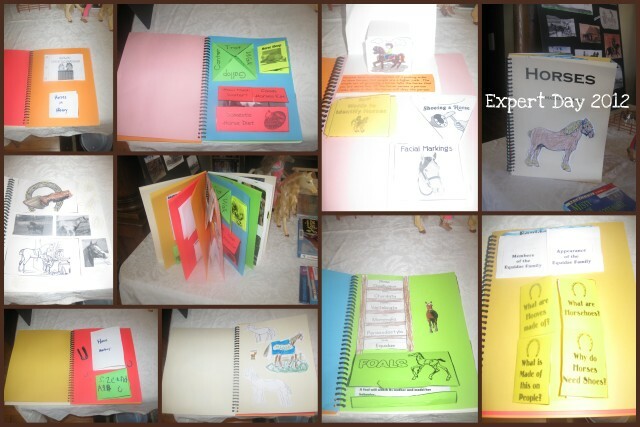 Although it really wasn’t my intention to begin with, Miss M’s Expert Day project for co-op turned into a fairly full fledged unit on horses. A few “easy non fiction” books from the library (which we already returned before I remembered to write down the titles!). Some Miss M read on her own time, and a few I assigned as part of her school work. We also checked out The Complete Horse and The Kingfisher Horse and Pony Encyclopedia to have on hand for further research. Both looked interesting, but we didn’t end up having time to dive into these very much. We read Misty of Chincoteage as a horse-related literature selection. I wrote about my impressions of that read-aloud last week. Miss M picked the broad topic of Horses for Expert Day, but since she only has three minutes to give a presentation, I encouraged her to pick a much narrower topic to focus in on. She decided to focus on how people used horses throughout history. 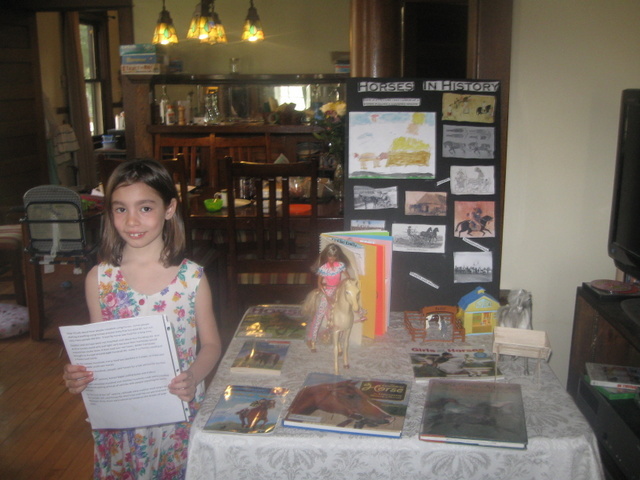 Since even that is a very broad topic, she chose to narrow it down even further and discuss how horses were used in war and for travel during her three minute oral report. I was able to work with Miss M on important skills like defining a topic, reading for the purpose of research, and summarizing important points of what she read. She narrated to me what she wanted to say in her oral report, and I transcribed and helped her refine what she was saying. As much as it was a lot of work, I am glad we have Expert Day at co-op each year to push us to work on these skills!